Designing a hotter, more forgiving face for generating distance with control was the inspiration behind the G30 fairway woods. A strong, uniform-thickness Carpenter 475 face maximises deflection to increase ball speed and generate distance. The face is also taller for additional face bending and forgiveness. Crown turbulators help with aim and confidence. And with five settings, you can add or subtract up to 1-degree of loft to optimise trajectories. Although the Golfmagic team had already encountered the 'turbulators' before, it came as a little shock to our two readers Brian and Ben. They'd both seen it in pictures but never in person. On first inspection, Brian loved it, Ben wasn't sure (he quickly changed his mind when piping his first shot 230 yards carry down his target line). All testers liked the taller face on offer, and again appreciated the difference in colours to better distinguish the face from the crown. All testers agreed the turbulators acted as useful alignment, placing the ball in the middle of the two smallest 'turbulators'. As always with Ping clubs, feel is superb. A well-balanced TFC 419F shaft, working in tangent with an easy to control clubhead, delivered strong results across the board. Ball striking felt immaculate throughout the testing, whether pure or squiffy hit. Up the top end for distance and certainly the most accurate of all the fairway woods tested. All testers averaged a carry of 225 yards with this one and offline dispersion was the strongest for three testers, something that speaks volumes. Relatively easy to get up in the air, particularly given we were testing out the 14.5-degree model - the lowest loft in the test. Nice ball speed gains for each tester and low spin rates contributing in some monster hits, especially off the tee. Two testers managed to hit a 240-yard carry with this club. Decent amount of workability, too, particularly a fade. Incredibly long, pin-seeking straight and easy to get in the air (even in a 14.5-degree offering as tested). Is it really worth splashing a whopping £210... the most expensive club, by a pound, in this test? Well if you're struggling with the fairway wood right now, we say 100%. 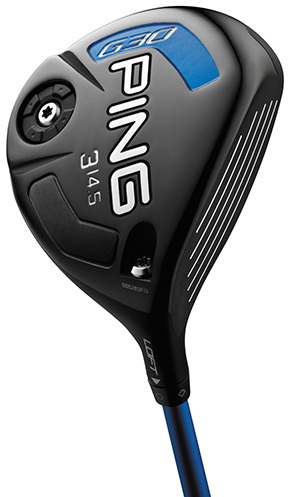 Two testers voted the G30 as their favourite fairway wood. Very impressive club.